.... It was at Runnymede, on June 15, 1215, that the idea of the law standing above the government first took contractual form. King John accepted that he would no longer get to make the rules up as he went along. From that acceptance flowed, ultimately, all the rights and freedoms that we now take for granted: uncensored newspapers, security of property, equality before the law, habeas corpus, regular elections, sanctity of contract, jury trials. Eight hundred years is a long wait. We British have, by any measure, been slow to recognize what we have. 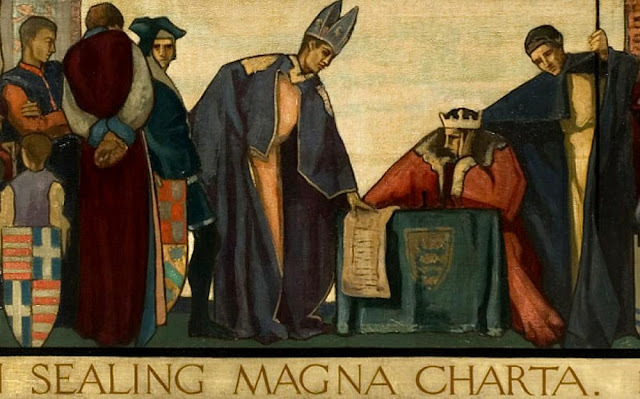 Americans, by contrast, have always been keenly aware of the document, referring to it respectfully as the Magna Carta. Also: Dan Jones, "Magna Carta: the things you didn't know"